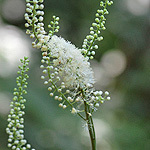 Bugbane, Black Bugbane, Cimicifuga racemosa (l.) Nutt. A quick glance from a distance could cause you to mistake Black Bugbane for Culver's Root. However, everything is different. Stems: Altogether, the plant and the tall flower panicle can reach 6 to 8 feet in height. Stems are light green and smooth. 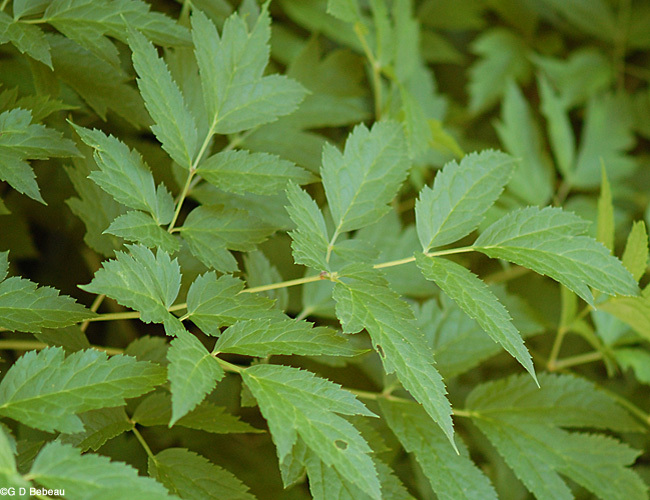 Leaves: The large leaves are 2 to 3 parted compound with 20 to 70 leaflets and are positioned well to the bottom of the tall stems. The large toothed leaflets have angled stalks and 3 prominent veins which are most noticeable on the terminal leaflet; leaflets are usually without hair. The terminal leaflet is usually 3-lobed. Upper stem leaves are bracts, not true leaves. Leaf joints frequently are purple. Inflorescence: The inflorescence is an erect tall, but narrow, panicle composed of raceme-like branches, with many small white flowers that appear fuzzy from a distance. At the base of the panicle is a single leafy bract. Flowers: Flowers have 4 sepals that disappear early and the 4 white petals are very small, with clawed bases, giving the flowers the appearance of nothing but stamens, of which there are 55 to over 100. 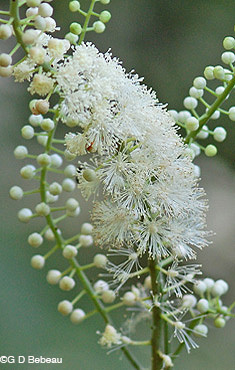 Anthers are white with white filaments. There is one pistil with a short thick style. Each flower is on a short stalk (pedicle). 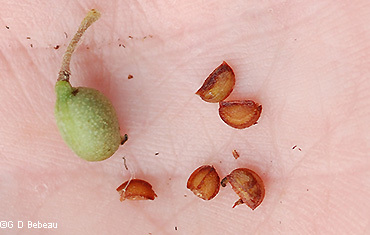 Seeds form in follicles in two rows, and when mature the follicle splits open on one side to release the seeds which are brown, flattened partial hemispheres, smooth but with a rough ridge, and have a small beak. Seeds require a warm moist period followed by a cold moist period in order to germinate. When planted outdoors they require a year to germinate. 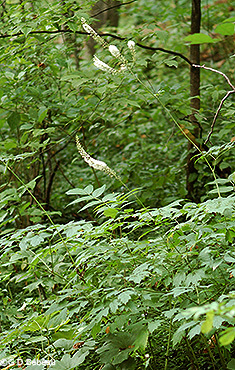 Habitat: Black Bugbane grows from a rhizomatous root system, preferring rich soil with partial sun to open shade in moist woods. The flowers have an unpleasant scent. These tall plants add a dose of white color in the woodland when there is little other color. For lore and uses see below. Names: The "black" in the name refers to the color of the root (a rhizome) which is actually a dark brown. There are differences in treatment between certain authorities as to the proper genus for this plant. The preferred classification by the authoritative Flora of North America is as listed above. The genus name of Cimicifuga is from cimex for "bug" and fugere meaning "to drive away". This yields the common name of Bugbane. The species name racemosa, refers to the branches of the flower cluster which are racemes. The author names for the plant classification are: 'L.' refers to Carl Linnaeus (1707-1778), Swedish botanist and the developer of the binomial nomenclature of modern taxonomy. His work was updated by ‘Nutt.’ which refers to Thomas Nuttall (1786-1859) English botanist who lived and worked in America from 1808 to 1841. On his many expeditions he collected many species that had been originally collected by Lewis and Clark but lost by them on their return journey. 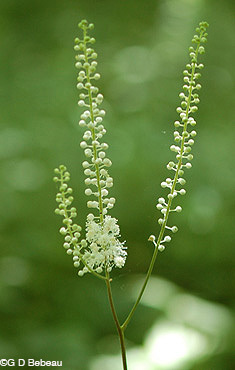 Some other authorities, such as USDA however, list the plant under the older name Actaea racemosa L. var. racemosa. 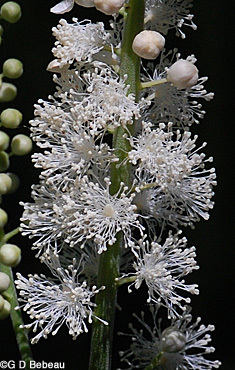 In current botanical work only those members of the Ranunculaceae that have berries as the fruits are considered in the genus Actaea and those with fruits in follicles are put into the Cimicifuga. Comparisons: The flower racemes, from a distance, resemble Culver's Root, but on close inspection, the plants are entirely different. Above: 1st photo - The inflorescence is a tall raceme atop the tall stem. This usually branches as shown. 2nd photo - Leaves are all clustered near the base of the plant. The tall flower spike can reach 6 to 8 feet high. 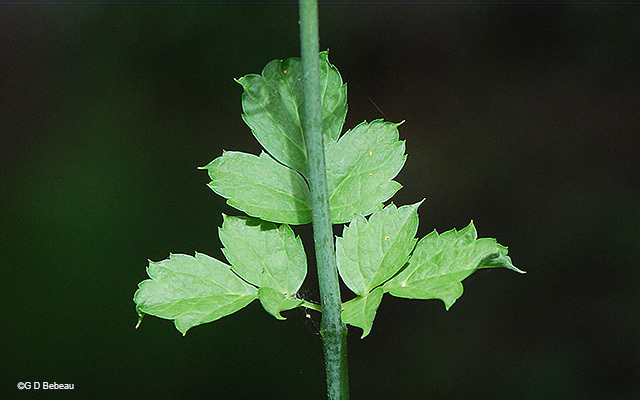 3rd photo - An example of the full compound leaf shown on a young plant where the divisions are easily seen. 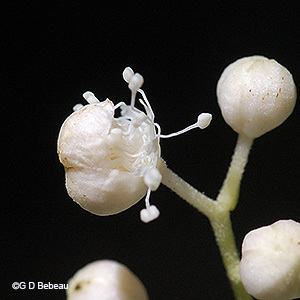 Below: 1st photo - There are 4 sepals that disappear early and the 4 white petals are very small, with clawed bases, giving the flowers the appearance of nothing but stamens, of which there are many. Anthers are white. In the center is the yellowish pistil already in the shape of the later seed folicle. 2nd photo - A flower just opening with the sepals about to fall away. Below - Flowers: 1st & 2nd photos - Each flower is on a short stalk (pedicle). Blooms begin in late June to early July and usually bloom well into August. 3rd photo - The root system is rhizomatous allowing the plant to spread vegetatively, but it is not aggressive. Root of a very young plant shown here. 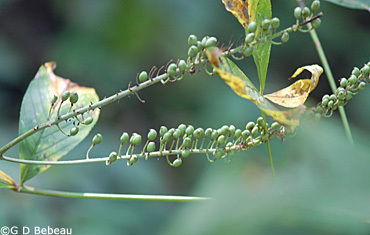 Below: 1st photo - Each folicle releases several brown seeds, which are flattened partial hemispheres, smooth but with a rough ridge, and have a small beak. 2nd photo - The seed folicles formed in early September. Note the two row structure. Below: At the base of the flower panicle is a single leafy bract. Below: The upper section of the compound leaf. The terminal leaflet of each subsection is the largest, usually 3-lobed and shows three prominent veins at its base. Notes: Black Bugbane was not listed on Martha Crone's 1951 inventory of plants in the Garden at that time, but then she reported planting it in 1951 and 1957. It was present at the time of the 1986 census. Gardener Cary George added plants in 1994. It is not native to Minnesota or Wisconsin, but generally it is native to the eastern half of the United States from Iowa eastward. In Canada it is found in Ontario and Quebec. It grows quite well in Minnesota where it has been established and primarily grown as an ornamental. Toxicity: Large medicinal doses produce symptoms of poisoning, particularly nausea and dizziness and can also provoke a miscarriage. 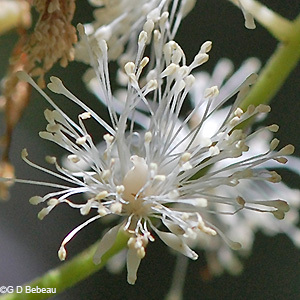 Lore and uses: Black Bugbane has a long medicinal history. It was listed in the National Formulary from 1936 to 1950 and in the US Pharmacopoeia from 1820 to 1936. 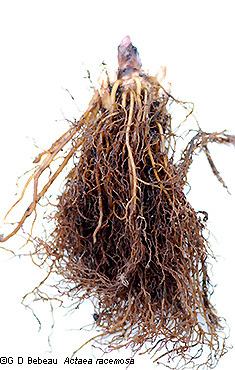 The stout, knotty root (a rhizome) is the usable part when collected in the Autumn. It has only a faint disagreeable odor, but a bitter and acrid taste. It contains an amorphous resinous substance called "cimicifugin", tannin, salicylic acid, trances of an alkaloid and three crystalline alcohols. The bitter taste is due to the crystalline principle called "Racemosin". The root was prepared as a dried powder for use in capsules or in decoctions in doses of .3 to 2.0 grams. In the 19th Century a tincture in doses of 2.0 to 4.0 ml when prepared in 60% alcohol was used. The most common use was an an anti-rheumatic, but also to prevent coughing (said to be very effective for whooping-cough), as a sedative and an emmenagogue (promotes menstrual discharge), and for cramping pains in the womb. 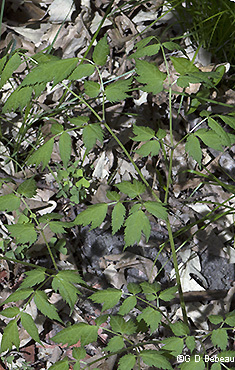 A common name, Squaw Root, refers to this usage. Dr. Lloyd (Ref. #21) reports that it was the native Americans of the east coast that introduced it to American medicine. Lab tests indicate that the extracts of the rhizome (root) have an anti-inflammatory effect. Dr. Clapp (Ref. #2) was a well known prescriber. More information in Grieve (Ref. #7).